This pull apart bread was super easy and added a nice twist to the traditional pumpkin bread. 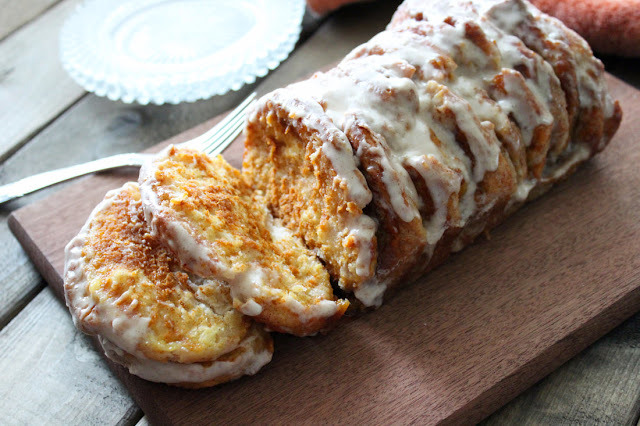 To me, this is like pumpkin bread and a cinnamon roll got together to have a baby and Oh. My. Goodness, cutest baby you ever did see! If there is one thing you need to add to your holiday menu list or just because, make sure it's this recipe! Preheat oven to 350°F. Spray a 9×5 inch loaf pan with nonstick cooking spray (use the kind with flour for best results or sprinkle your greased pan with a little flour). Stir together the pumpkin pie mix and egg. Set aside. Open the can of biscuits and slice each in half horizontally making a total of 16 biscuit rounds out of the 8. Stir together 1/4 cup granulated sugar and 1 teaspoon cinnamon in a small bowl. Coat each slice of raw biscuit dough with the cinnamon sugar mixture. Spread slightly less than 1 tablespoon pumpkin pie mix on top of each biscuit round then place another biscuit piece on top. Add more pumpkin mixture and continue stacking, spreading, and layering until you’re out of biscuits. Place carefully into the pan. Bake 40 to 45 minutes or until loaf is deep golden brown and center is baked through. If your loaf starts to get too brown then loosely cover it with foil. Cool 10 minutes. In small bowl, mix powdered sugar, milk, vanilla and 1 teaspoon of cinnamon until thin enough to drizzle. Drizzle over warm loaf and serve.